Original Editors - Suzette Austin & Erica Jezke from Bellarmine University's Pathophysiology of Complex Patient Problems project. Hyperparathyroidism is a disorder caused by oversecretion of parathyroid hormone (PTH) by one or more of the four parathyroid glands. This disorder can disrupt calcium, phosphate, and bone metabolism. 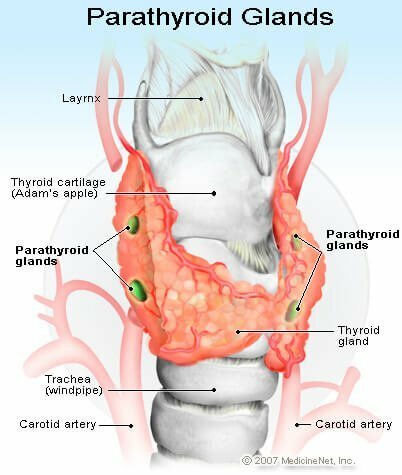 The parathyroid glands are located in the neck on the posterior surface of each lobe of the thyroid gland. Each of the four parathyroid glands is about the size of a grain of rice. As part of the endocrine system, these glands secrete parathyroid hormone (PTH), which regulates calcium and phosphorus. Hyperparathyroidism is classified into three groups: primary, secondary, or tertiary. Secondary hyperparathyroidism occurs when the glands have become enlarged due to malfunction of another organ system. Causes of secondary hyperparathyroidism include; severe deficiency in vitamin D, severe deficiency in calcium, and chronic renal failure. Chronic renal failure is the most common cause of secondary hyperparathyroidism. Tertiary hyperparathyroidism is seen in dialysis clients who have chronic secondary hyperparathyroidism. Dialysis clients who suffer from chronic renal failure lack the ability to absorb and convert vitamin D into a form that can be used by the body. This decline in vitamin D decreases the amount of calcium that can be absorbed. Hyperparathyroidism is most prevalent in postmenopausal women over the age of 60, and is most common in the sixth decade of life. Incidence of hyperparathyroidism is about equal in men and women under the age of 50. Incidence increases with age and female gender. The occurrence of hyperparathyroidism is highest among blacks followed by whites. The condition is less prevalent in asians, hispanics, and other races. The incidence of primary hyperparathyroidism in the general population is about 4 per 100,000 per year. Most cases (80%) of hyperparthyroidism are discovered accidental during routine blood tests. Calcimimetics. Calcimimetics mimic calcium circulating in the blood and may trick the parathyroid glands into releasing less parathyroid hormone. It may be prescribed to treat primary hyperparathyroidism, particularly if surgery hasn't successfully cured the disorder or a person isn't a good candidate for surgery. Hormone replacement therapy. Hormone replacement therapy (HRT) does not address the underlying causes of excess PTH but helps to prevent bone from demineralizing as a result of excess PTH in the blood. HRT is used for menopausal women or for individuals who are exhibiting signs of osteoporosis. Estrogen and progestin are commonly used in combination for this treatment option. Bisphosphonates- Bisphosphonates prevents the loss of calcium from bones decreasing the risk for development of osteoporosis which is caused by hyperparathyroidism. Calcitonin- Calcitonin is used in the treatment of osteoporosis. It binds to osteoclasts and inhibits their action, helping to prevent the breakdown of bone. Blood tests are used to indicate how much calcium, PTH and phosphorus are in the blood. If an elevated amount of any of these is found in the blood it may be indicative of overactivity of the parathyroid glands. Imaging tests of kidneys. Used to determine presence of kidney stones or other kidney abnormalities. Primary hyperparathyroidism is often caused by an adenoma of the parathyroid gland. Therapists may observe skeletal, articular and neuromuscular impairments associated with hyperparathyroidism. In the acute phase, therapists should exercise caution with patients as they are at an increased risk for bone fracture. 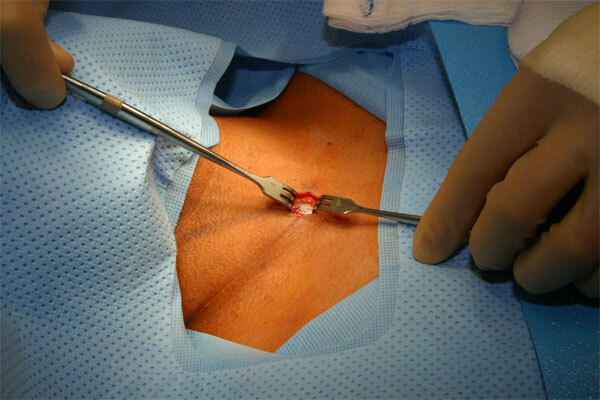 After surgery, patients should be encouraged to ambulate as soon as possible to prevent further demineralization. Encourage and aid patients in setting up their homes to avoid or minimize fall risks. Eating a healthy and well balanced natural diet, avoiding coffee, tea, alcohol, tobacco, and carbonated beverages, exercising regularly, and drinking plenty of water may help to reduce the symptoms of hyperparathyroidism. Some herbal supplements have been used for the treatment of hyperparathyroidism including chaste tree and dandelion. Some holistic medical practitioners also treat hyperparathyroidism. Vitamin supplements including calcium, vitamin D, Ipriflavone (soy isoflavones) standardized extract and Omega-3 fatty acids have been used to help treat this disorder. Alternative treatments for hyperparathyroidism have not been proven effective for the management of hyperparathyroidism. Alternative/holistic treatment options should be discussed with a qualified healthcare practitioner prior to initiation. A patient with persistent primary hyperparathyroidism due to a second ectopic adenoma. A 33 year old woman was diagnosed with hyperparathyroidism and treated with parathyroidectomy. Post-operatively the patient’s serum calcium and PTH levels decreased but did not normalize and continued to present with kidney stones. Diplopia associated with hyperparathyroidism: report of a case. A 60 year old man presented with diplopia as well as common symptoms of hyperparathyroidism. He was diagnosed with primary hyperparathyroidism and a search for the cause of the diplopia continued. After undergoing thyroidectomy his double vision was relieved as his serum calcium levels returned to normal. A 32 year old man presents with repetitive episodes of pancreatitis. 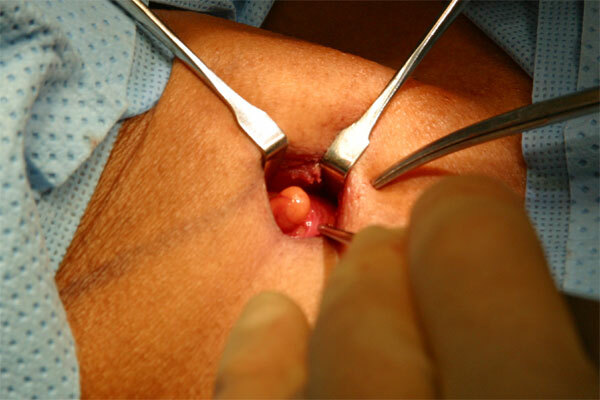 Patient was treated by parathyroidectomy and recurrence of abdominal pain ceased and serum calcium levels normalized. ↑ 1.00 1.01 1.02 1.03 1.04 1.05 1.06 1.07 1.08 1.09 1.10 1.11 1.12 1.13 1.14 1.15 1.16 1.17 1.18 1.19 1.20 1.21 1.22 1.23 1.24 1.25 1.26 1.27 1.28 1.29 1.30 1.31 1.32 1.33 1.34 1.35 Goodman C, Fuller K.. Pathology: Implications for the Physical Therapist, 3rd ed. St. Louis, Missouri: Saunders Elsevir; 2007. ↑ 2.00 2.01 2.02 2.03 2.04 2.05 2.06 2.07 2.08 2.09 2.10 2.11 2.12 Goodman C, Snyder T. Differential Diagnosis for Physical Therapists: Screening for Referral, 5th ed. St. Louis, Missouri: Saunders Elsevir; 2013. ↑ 3.0 3.1 3.2 3.3 3.4 3.5 3.6 Mayo Clinic Staff. Diseases-conditions/hyperparathyroidism/basics/symptoms. http://www.mayoclinic.org (accessed January 16, 2014). ↑ 6.0 6.1 6.2 6.3 6.4 Yeh M, Ituarte P, Adams A, et al. . Incidence and prevalence of primary hyperparathyroidism in a racially mixed population.. The Journal Of Clinical Endocrinology And Metabolism 2013; (98(3)): 1122-1129. ↑ 7.0 7.1 7.2 7.3 7.4 7.5 7.6 Mayo Clinic Staff. Diseases-conditions/hyperparathyroidism/treatment. http://www.mayoclinic.org (accessed January 16, 2014). ↑ 8.0 8.1 Gladson B. Pharmacology for Rehabilitation Professionals, 2nd ed. St. Louis: Elseivier Saunders; 2011. ↑ Vestergaard P,Mosekilde L. Cohort study on effects of parathyroid surgery on multiple outcomes in primary hyperparathyroidism.BJM 2003;327(7174):530-534. ↑ Forman B.H., Ciardiello K., Landau S.J., Freedman J.K. (1995) 'Diplopia associated with hyperparathyroidism: report of a case', Yale J Biol Med, 68(5-6), pp. 215-217 [Online]. 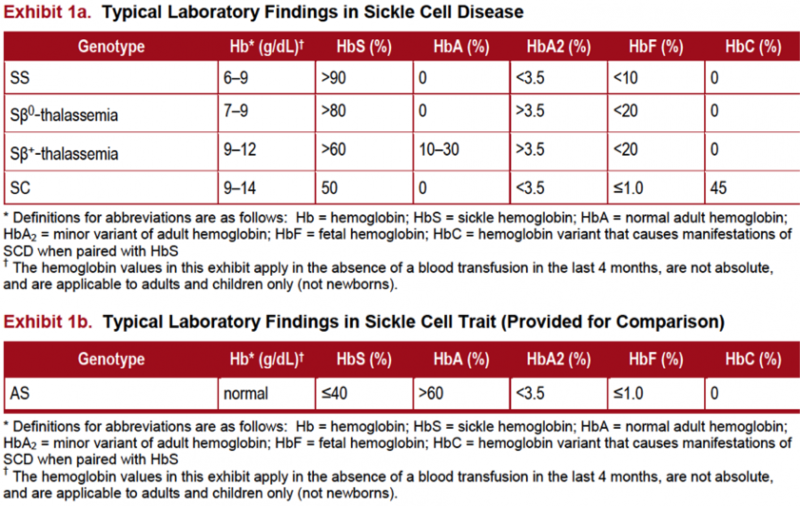 Available at: http://www.ncbi.nlm.nih.gov/pmc/articles/PMC2588946/ (Accessed: 17th January 2014).